A new scope set to be included in Ubuntu by default will allow users of The Pirate Bay to conduct BitTorrent searches directly from Unity desktop. The tool's creator informs TorrentFreak that while there is still work to be done, the aim of the scope - which is endorsed by Canonical founder Mark Shuttleworth - is to embed Free Culture directly into the Ubuntu user experience. “The tool is super-useful and it’s perfectly justified to make it available by default. We use torrents for distributing Ubuntu itself. So please don’t hold back!﻿” Shuttleworth wrote. We caught up with David Callé to find out more about his torrent experience and what motivated him to create the tool. “I use torrents to seed ISO images for Linux distributions, Ubuntu of course, but Linux Mint and Fedora as well,” David told TorrentFreak. Clearly David had Ubuntu’s image in mind when he hesitated over its inclusion in Ubuntu by default. What pitfalls did he foresee at that early stage and has he now changed his mind? “I still have reservations: the current prototype uses a TPB [The Pirate Bay] backend and is in a very early state in terms of filtering what is presented to the user and how it does it,” the developer explains. While the word ‘filtering’ might cause some concern, David says that any filtering will be switchable so that users are able to get the full BitTorrent search experience if they so desire. Of course, while the torrent scope may attempt some filtering in order to promote open license and public domain content, for users in some countries their ISPs are already attempting to get rid of the whole range of material by blocking sites such as The Pirate Bay. Will there be any attempt to counter this problem? 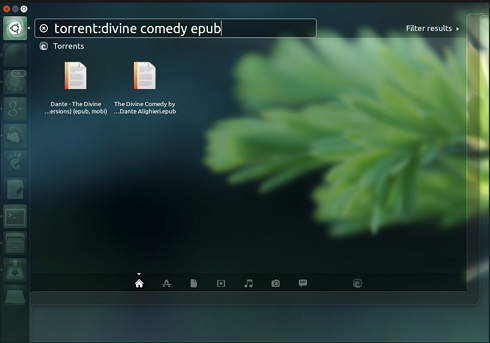 “The Dash is a prominent part of the Ubuntu desktop and is even more ‘front and center’ in the phone/tablet version. It’s a metasearch engine that aggregates many sources (about 70, such as DeviantART, SoundCloud, Amazon, etc.) and the torrents scope is planned to be one of these,” David explains. Time will tell how ‘strict’ the scope will be in the results it returns (filtering is not yet here according to David) but for those looking to support open license material it is certainly one to watch.